Students from all around the world go to school at San Diego State. It’s too bad their physicians can’t come with them. Fortunately, the Calpulli Center is amazing in offering many free services to students: from birth control and STD screenings to primary care for the common cold, and other everyday illnesses. Having the ability to receive medical attention and advice from the nurse practitioners, or fill and pick up prescriptions, all conveniently located on campus, is very helpful for students. While this service is tremendously useful for students, its assistance to professors is often overlooked. SDSU professors don’t have access to any services from Student Health Services. Faculty and staff are expected to fend for themselves and acquire healthcare elsewhere. Although the student aspect is in the name, there are special circumstances, such as the recent meningitis scare, where professors deserve the same health perks. According to school officials, whether faculty and staff employees qualify for health insurance depends on the their appointment and time base. That puts the health of professors on the back-burner. So, if one does not qualify, it becomes a personal problem. SDSU professors are a vital part of our campus and they come into contact with hundreds, even thousands, of students every day. Being in contact with that many students on a daily basis categorizes them as high-risk targets to any viral and/or bacterial outbreaks potentially going around. This risk alone is enough to take the health of professors more seriously. It’s equally important for students to surround themselves with healthy professors, especially in light of the SDSU meningitis scare. According to SHS, faculty and staff have to be treated somehow, but certain professors (who prefer to remain anonymous) were excluded from the evaluations and antibiotics provided during this scare. 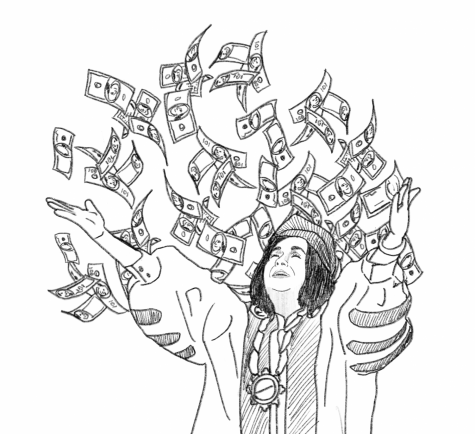 Granted, SHS is paid for by students through registration health fees, rationalizing its exclusivity for students. But under such circumstances, I would expect faculty and staff to have the same access to offered services. 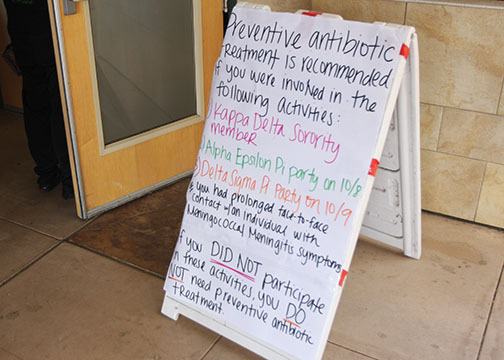 With any potential outbreaks, professors are at risk along with the student body. As explained by SHS, exceptions are made for faculty and staff in regards to flu immunization, optometry care, first aid for on-campus injuries and cases when employees are also enrolled as a student. SHS also states it gives teachers preventative care when it comes to campus health crises. But this statement is contradicted by the instances of the few professors who were denied access to said preventive measures, evaluations and antibiotics. More than 1,000 students were seen by SHS and more than 400 of them were given antibiotics — students with secondary contact were not given antibiotics due to low risk. For individuals at low risk who still wish to take preventative measures, vaccines are on sale at the health office for the not-so-low price of $91. Students have access to so many free amenities on campus, specifically at SHS where nurses can see sick or injured students, prescribe medications, or provide information on pharmacies with discounted prices. Whether the student has health insurance is not a big concern when it comes to appointments, but matters more when it comes to perceptions. With recent faculty protests of salary contract settlements, turning teachers away from a campus-wide health issue is blatant disrespect. Whether it’s SHS or the California State University system, faculty and staff continue receiving the shorter end of the stick. According to the CSU website, only employees who have worked half-time for more than six months, fulfilled six weighted teaching units in one semester, or two consecutive quarters, qualify for medical coverage. Non-eligible employees include: graduate assistants, student assistants, intermittent employees, faculty members only hired to teach summer session, extension or intersession and those who aren’t paid by the CSU. However, all this medical coverage doesn’t even apply to SHS, whose care isn’t given to teachers unless specified in their exceptions. Sure, professors can possibly afford to purchase the vaccine as well as other medication, but that’s not the point. The point is through vague coverage guidelines by the CSU, SDSU professors were hung out to dry by the health services provided by SDSU. The Meningitis Foundation of America offers extensive information regarding diagnosis, immunization, recovery and the after effects of meningitis. MFA survives primarily by donations. For the past 17 years, we have assisted people through support groups, resources and advocacy in efforts to help those affected with meningitis overcome and those around them understand the journey ahead. We promote prevention and safety measure in at risk communities and help explain the short term, long term effects and recovery treatments of meningitis to the media and public at large. Meningitis is a dangerous & often times fatal infection that can lead to serious life-long physical problems and even death. We are here to provide emotional support to those who need it; please feel free to reach out to us at http://www.musa.org.